Officials at the largest federal employee union said Thursday that agencies’ recent efforts to implement a series of controversial workforce executive orders are intended to prevent them from performing duties that are required by law. 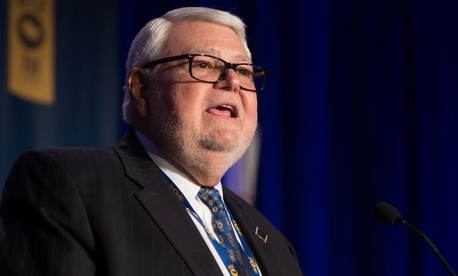 In a call with reporters, American Federation of Government Employees National President J. David Cox said that union access to office space is integral to labor groups’ being able to meet with and represent front-line employees as required by the 1978 Civil Service Reform Act. Union leaders representing employees at the Social Security Administration, the Veterans Affairs Department and the Bureau of Prisons said management is moving to evict unions from office space, preventing them from taking documents off-site and blocking them from using official time or unpaid leave to represent workers. In May, President Trump signed three executive orders, currently the subject of a legal challenge, aimed at making it easier to fire federal employees and reducing the influence of unions in the federal workplace. One order focused on the practice of official time, where union employees are compensated for representational work, instructing agencies to cap it at 25 percent of an employee’s work hours and to either evict unions from on-site office space or to charge rent. Last week, OPM published guidance for the implementation of the orders, and beginning Monday, federal unions began reporting efforts by management to remove them from the premises. Barri Sue Bryant, president of AFGE Local 2908, which represents SSA employees in Philadelphia, said eviction from agency property, combined with other management initiatives, will make it nearly impossible to represent employees. Katrina Lopez, vice president of AFGE Local 3172, which represents SSA employees in Fresno, Calif., said there are similar management efforts to prevent union officials from being able to engage in ongoing collective bargaining negotiations, circumventing a provision of the executive order that allows for official time to be used for bargaining. John Kostelnik, president of AFGE Local 3969, which represents Bureau of Prisons employees in Victorville, Calif., said the administration’s implementation of the executive order has hamstrung the agency’s ability to respond to the massive influx of detainees from the White House’s zero tolerance policy for undocumented immigrants and asylum seekers. The size of the medical staff at the prison is a particular problem, said Kostelnik, an issue that has been exacerbated in recent weeks.